OCCUPATION: I make/press skateboards at Penns Wood Manufacturing, we make the best concaves, just sayin. Where do you like skating? All over town, in the streets. Why did you go Veg? Mainly because meat started to seem more and more gross to me. I was vegetarian for about 2 months before switching to vegan. I became vegan for ethical reasons. Taking somethings life to turn it into a product made me even more sick than meat itself. What is your favorite thing to skate and why? I like huge cement banks, ledges, and manual pads. I’ve never been great with flip tricks, I’ve always liked weird tricks and old school style tricks. What shoe are you skating in now? Right now im in some Vans eras. I know they are by far the worse thing to skate in but its all I have right now until I get more cash, then I wanna snag those Vans half cab all canvas. Or just say whatever you want about skating Veg… I’ve realized since I’ve become vegan that its obviously easier to skate, I mean I lost about 60 pounds when I went vegan and am in so much better shape now. 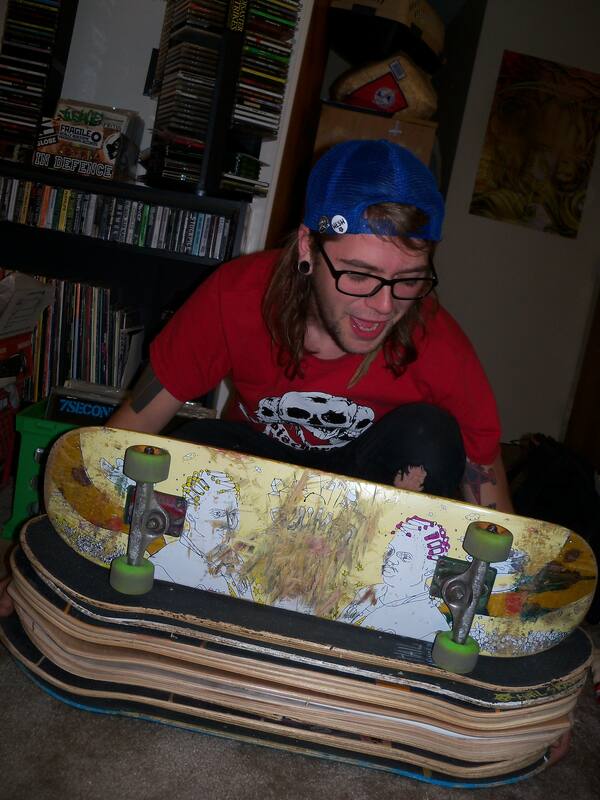 I wish more people were veg and felt as great as I, and Im sure all other veg skaters, do. Also I’m stoked I stumbled on this site. It’s awesome, Keep it up. Im gonna rep it as much as I can. Thanks Justin! Keep pressing those decks and making quality concave. Really digging that Scum Co. board too! If any of you have yet to see the Doc Ellis animation from No Mas, go check it.